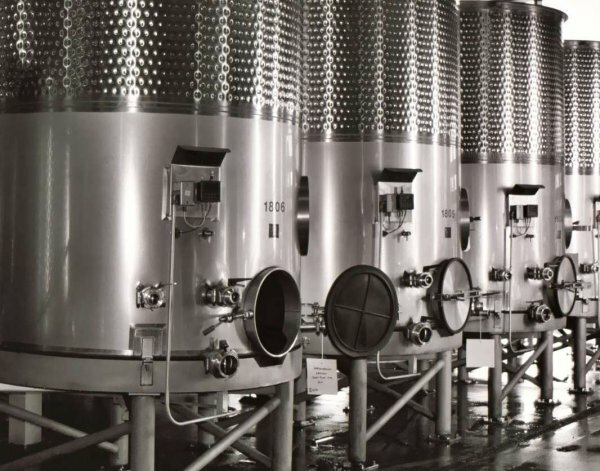 Frain Industries carries hundreds of used, stainless steel storage and processing tanks. Tanks vary greatly in their shape, size, and application. Frain stocks tanks ranging from 5 gallons to 10,000 gallons in many different configurations including: jacketed, single wall, vertical, horizontal, cone bottom, dish bottom, insulated, with or without agitation, CIP (clean in place), and many others. Additionally tanks can be made of multiple grades of stainless steel (typically 304 or 316/316L) with different levels of corrosion resistance. Types of agitation available include: prop agitation, high sheer agitation, sweep agitation, dual agitation, emulsification, turbines, impellers, cage beaters, anchor paddles, gate paddles, and many others. Jacket types include: conventional jackets, high pressure jackets, half-pipe coil jackets, multiple zone jackets, dimple jackets, and plate coils. The Frain Industries engineering team can place you into a storage or processing tank solution for your application. 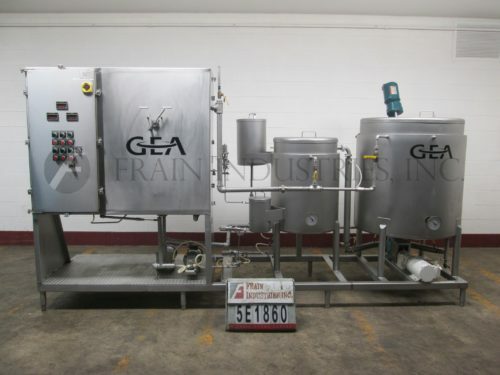 If you are looking for a single tank or an integrated solution with automated fill and discharge options Frain has the equipment for your needs. Frain Industries carries used tanks from many OEM’s including A&B Processing, Abec, Ace, Alfa Laval, Allegheny, American Process Systems, Apache, APV, APV Crepaco, B&G, CE Howard, Chem Tek, Cherry Burrell, Chester Jenson, Cream City, Crepaco, Dairy Craft, Damrow, DCI, Dover, Feldmeier, Groen, Highland, Howard, Langsenkamp, Lee, Letsch, Mueller, New Brunswick, Northland Stainless, Nova, Perma San, Perry, Pfaulder, Precision, Precision Stainless, Seitz Stainless, Walker, Willflow, and many others. Lee, 100 Liter capacity, 316 stainless steel, internal pressure reaction tank. Vessel dimensions: 23" diameter x 18" deep with a 13" straight wall. Equipped with 8" diameter bolt down manway, pneumatic powered prop agitation and 2"OD / 1½"ID Tri-Clamp style discharge with 15" ground clearance. Mounted on (4) stainless steel legs with casters. Langsenkamp, 1200 gallon, 304 stainless steel insulated and low pressure jacketed tank. 78" diameter x 60" straight wall. Equipped with (2) 1½" and (2) 1" jacket in/out, dome top with (1) 19" diameter man way with lift off lid, (1) 7"ID open vent and (1) 4"ID/9"OD 8-bolt flanged fitting. The sidewall has (1) 3"ID/8"OD diameter four-bolt pattern flange fitting and a thermowell. Dish bottom has (1) 6" diameter eight bolt pattern flange discharge with 10" ground clearance. Mounted on (4) stainless steel legs. 300 gallon, low pressure 15 psi jacketed mix tank. Vessel dimensions: 55" in Diameter; 30" Straight Wall. Equipped with flip top cover, center mounted sweep agitation, 2"OD / 1½"ID Tri-clamp style side bottom discharge with 38" floor clearance and self contained side mounted water heater circulation system with a 6Kw immersion heater. SXR, 500 gallon, jacketed mixing tank. 63" diameter x 90" straight wall, domed top, with 21" L x 17" W manway and top mounted prop agitator, has two 3" diameter top inlets with 2-3/4" flange, two 2" diameter top inlet with 3/4" flange and two 1" diameter top inlet with 2" flange. 304 stainless steel shell, full vacuum rated at 200psi @ 300F and carbom steel Jacket rated at 40psi @ 300F. Dish bottom with 3" diameter threaded center bottom discharge with 2-1/4" flange and 20" ground clearance and mounted on four legs. Niro Atomizer, Heating and cooling lecithin mixing and re-circulation system. Consists of a 160 gallon 36" dia x 36" straight wall tank with 1/2 Hp Lightnin mixer and a 58 gallon 24" dia x 29" straight wall tank. Both water jacketed with 1/2 flip top covers, (2) 1" jacket in/outlets, (2) 1 1/2" top side sanitary product inlets, temp gauge and flat bottom with a 1 1/2" side bottom discharge. Has a Waukesha model 1040 S/S, sanitary PD pump with 1 1/2" in / outlets and Baldor 1.5 hp gear drive, triclover PR10 S/S, positive displacement pump with 1.5 hp drive. Control panel for hot water, pump, mixer and flow controls with e-stops and a A/B 3636 controller and is mounted on common base frame. Feldmeier, 1000 gallon, 316 stainless steel, isulated portable liquid holding tank. Vessel dimensions: 80" diameter x 90" deep with 42" straight wall. Equipped with dome top, 20" man way with flip up / bolt down cover and (1) thermowell. Cone bottom has 3½" OD / 3" ID Tri-clamp style bottom discharge with 3" ground clearance. Mounted on stainless steel (4) leg base with casters. Holloway America, 850 Liter, 316L stainless steel jacketed process tank. Vessel dimensions: 45" ID x 36" deep with 32" straight wall. Equipped with an 18" diameter bolt down manway, (2) CIP spray ball supplied by a 2"OD / 1½"ID Tri-Clamp fitting, (1) thermowells, ½ Hp top mounted dual prop agitator and 2" OD / 1½" ID tri-clamp style bottom center discharge with 19" ground clearance. Feldmeier, 4500 Litre or 1125 gallon capacity, 316 stainless steel 3-zone jacketed process tank. Vessel dimensions: 76" ID x 72" deep with 60" straight wall. Equipped with a dome top, slant bottom, (1) 20" diameter top entry hinged man way, (2) thermowells, 3 Hp top mounted 27" diameter prop agitator and 2½" OD / 2" ID tri-clamp style bottom center discharge with a 12" ground clearance. Lee 130 gallon (500 Liter) portable 316 stainless steel mixing vessel. Vessel Dimensions: 34"ID x 30"high straight wall, Vessel Pressure Rating: Max. Design Internal FV/35 psi @ 281°F. Equipped with dome top/dish bottom, 18"diameter manway with clampdown cover, 3"ID tri-clamp port, (8) 1-1/2"ID sanitary tri-clamp connection inlet ports, inclined/offset mixer with 4" prop agitation, 1-1/2"ID center bottom tri-clamp outlet, 3" ground clearance. Tank mounted on (4) heavy duty casters, two swivel with brakes. 300 Gallon, (2) compartment, 304 stainless steel. Each compartment is 300 gallons with inner dimensions of 46" x 40" x 42" Deep. Equipped with flip up covers, top mounted spray balls and prop style mixers with ½ Hp motor drives and gauges. Slant bottom has 2½" OD / 2" ID sanitary side bottom discharge port with 15" ground clearance. Mounted on (6) stainless steel legs. Rectangle construction provides maximum capacity in small floor area. 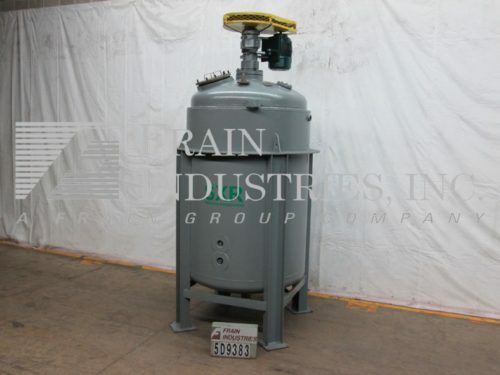 Stricklin, 180 gallon, 304 stainless steel, jacketed and insulated, internal vacuum tank. Vessel dimensions: 47" diameter x 42" deep with a 36" straight wall. Equipped with flip up covers, bridge mounted sweep agitation and 3"OD / 2½"ID Tri-Clamp style discharge with 41" ground clearance. Mounted on (3) tubular legs.